Watch out! 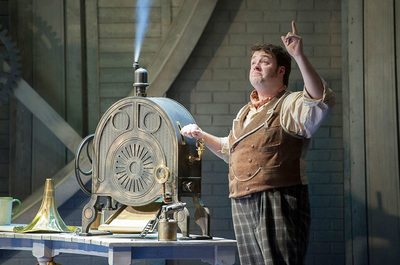 The most Fantasmagorical musical, Chitty Chitty Bang Bang, lands at the Cliffs Pavilion in 2016. Having broken all box office records in the West End, this fun-filled production from the team that brought you Fiddler on the Roof and The King and I promises laughs, magic galore and favourite songs including Chitty Chitty Bang Bang, Hushabye Mountain and Truly Scrumptious – and Chitty herself! Read all about what Martin Kemp and Jason Manford have to say about appearing in the show. From gangster Reggie Kray to evil control freak Steve Owen in EastEnders, Martin Kemp is extremely good at being bad. Currently on tour in Chitty Chitty Bang Bang playing the Childcatcher, arguably one of the most iconic villains of all time, Martin is drawing on his previous roles for inspiration, but admits that there’s unchartered territory to explore when it comes to the character that regularly tops the polls of movie monsters. As for his fellow cast members, mention them and it is Martin with a big smile on his face. And so they are. 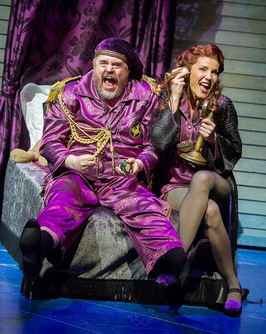 Funny men Jason Manford as Caractacus Potts and Phill Jupitus as Lord Scrumptious and Baron Bomburst are joined by Martin and Michelle, as well as Andy Hockley of Phantom of the Opera fame as Grandpa Potts, and West End leading lady Amy Griffiths as Truly Scrumptious. Add to that a world class company of singers and dancers and you have a show that is dazzling, star-studded and that absolutely lives up to the ‘fantasmagorical’ praise. A member of one of the most popular bands of all time, star of movies, TV and now a musical, Martin certainly can’t complain of always doing the same old same old. “I have always changed it up a bit and I like never knowing what’s around the corner,” he laughed, although actually this time he does know what is coming next. “I have just finished a year on tour with Spandau which was wonderful, but it’s this great big machine that needs five artic trucks and a 100-strong crew. When you play huge arenas the size of Wembley you know that to people at the back you’re just a speck of dust in the distance and that you’ll never get to meet those people. So in May I am doing the sort of antidote to not meeting people with a show that’s going to tour called An Audience with Martin Kemp. I’ll be travelling around England chatting about my life and career and taking questions from the audience. Yeah, it’s going to be different and fun,” he grinned. Talking of travel, Southend is a place that Martin has enjoyed visiting before. “I am really looking forward to going back as the Childcatcher in Chitty,” he said. With such a busy professional life, relaxation, he says, comes in the form of painting. 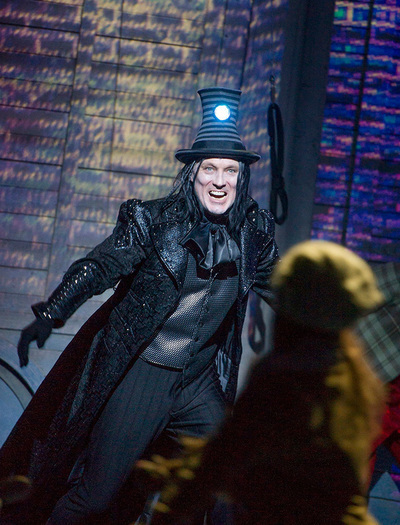 Super-talented, funny, warm and with rock ‘n’ roll artistic flair to boot, however brilliantly nasty he is as the Childcatcher, in real life Martin Kemp is a total sweetie. There's more to Jason Manford than being funny. Warm, articulate and astute, he also happens to have been born into a family of talented singers. Trilling for longer than he's been cracking gags, the 8 Out of 10 Cats star has notched up some impressive credits, not least playing Pirelli in Sweeney Todd with Michael Ball and Imelda Staunton, and Leo Bloom in The Producers with Phill Jupitus, with whom he also stars in a brand new touring version of the classic musical story Chitty Chitty Bang Bang. 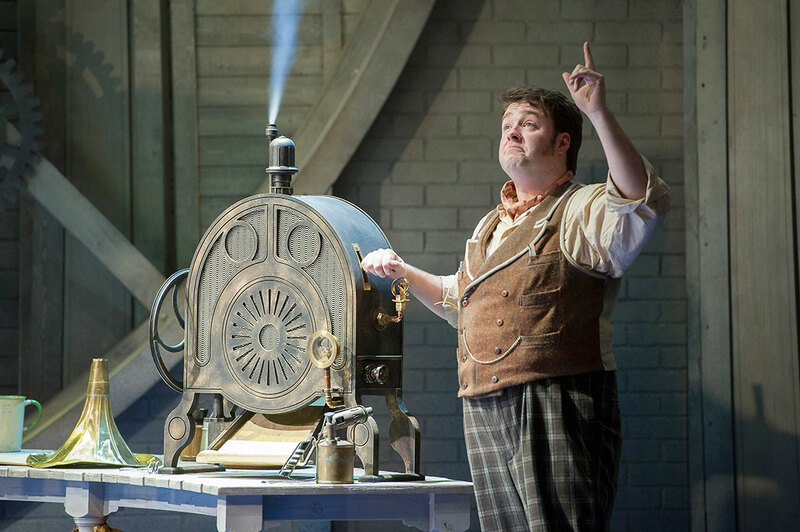 Offered the role of Caractacus Potts, Jason says that while he didn't want to over-think the characterisation, he nevertheless gave careful consideration to what he could bring to the role. “I re-watched the film and what I saw was someone who was not dissimilar to me: a dad who would do anything for his kids. He keeps trying and failing and he’s reached a point in life where he thinks that something just has to go right for him. It is a highly physical show for Jason and he confessed that the number Me Ol’ Bamboo, in particular, is a bit of a killer. 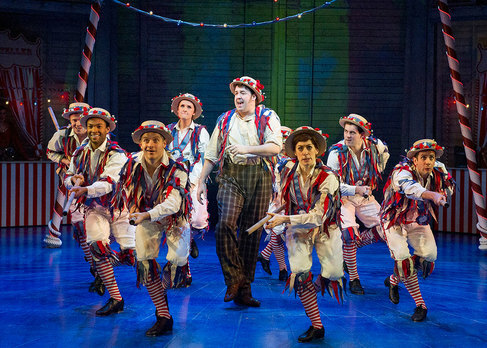 Part manic Morris dance and part frenzied tap routine, it is certainly breath-taking to watch and, one suspects, leaves even the fittest dancers out of breath. “I’ve lost a stone and a half – it’s unbelievable!” he said, shaking his head in disbelief. Does such a frenetic routine result in a few aches and pains? A heartfelt groan said it all. “My poor knees and lower back! Ibuprofen is getting me through and I have to go for a swim between the matinée and evening shows because if I sit down I seize up,” he sighed. And when he staggers off the stage and back to his digs he’s got fellow cast member Phill Jupitus [who plays Baron Bomburst and Lord Scrumptious] to look out for him and, it transpires, to rustle up some top-notch grub. Talking about being away from home, with a partner, and five children, Jason’s got plenty to miss. As for the tour itself, Jason is especially looking forward to Southend. “I’ll be stopping at Phill’s house when we play Southend,” he said, grinning, clearly anticipating a week of good grub, cooked from scratch by Mr Jupitus. The performance on Thursday 21 April at 7.30pm will be a relaxed performance. The relaxed performance will be specially adapted for customers with learning difficulties, autistic spectrum disorder or anyone who may benefit from a more flexible theatre experience, and their carers. There will be a less formal atmosphere and a relaxed attitude to noise and movement. Elements of the show will be adapted, dampening the sensory overload without compromising quality.